Across the world, close to 800 million people, that is one in nine people, still struggle with hunger, while many more lack access to healthy and nutritious food. This food crisis is not unique to the developing world, in the United States and Europe millions of people live in food-insecure households. Achieving food security and improved nutrition is a key goal of the sustainability agenda, which can only be reached by empowering communities to provide for themselves, especially in urban areas, where 60 percent of the world population is likely to live by 2030 and where food production is particularly challenging. To help disseminate good practices in urban farming, we’ve just added new entries to the Project Hub, Solutions Database and Library. First comes a thrilling urban farming project, the Finca del Sur in the South Bronx, New York. The name translates from Spanish as “Farm of the South” which reflects the Latina/o heritage of many of the farmers. Founded in 2009, the urban farmer cooperative reclaimed and transformed an abandoned plot of land situated between highway ramps and train lines into a thriving community garden. 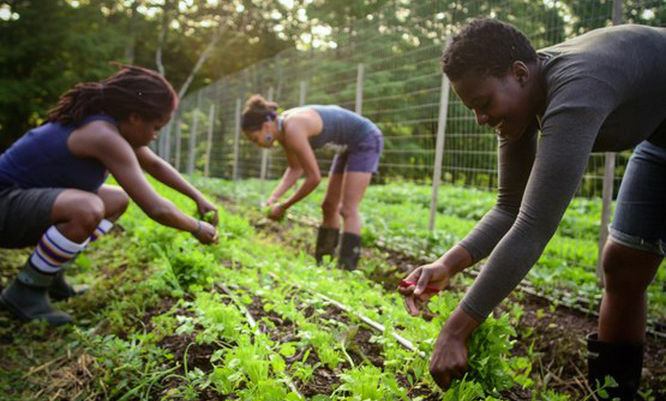 The garden provides a safe space in particular for Latina and Black women to grow fresh food, practice leadership skills and contribute to food justice in low-income communities. Cultivating food equity and revitalising land also requires the right technical tools and a number of solutions have emerged to support community farming and local food economies, such as the Farm-from-a-Box, a modified shipping container that provides communities with everything they need to grow their own two-acre farm. Coined the “Swiss-Army knife of sustainable farming”, the unit can be equipped with basic farming tools, a seedling house, a micro-drip irrigation system, a water pump and internet connectivity to check, for instance, weather conditions. The whole system is powered by renewable energy to be used off-grid. The California-based social business that developed the Farm-from-a-Box concept has delivered its first unit “Adam” to Santa Rosa College’s Shone Farm in Sonoma County, California, and is planning to send a second box to a local women’s cooperative in the Rift Valley in Ethiopia. To support training in community farming, we also added new interesting resources to the Library, such as the Urban Agriculture Toolkit developed in 2016 by the United States Department of Agriculture, which provides information on costs, land access and accessing capital and financing for urban farmers. Do you know of other great initiatives, projects, solutions or resources worth adding to our databases, contact us!